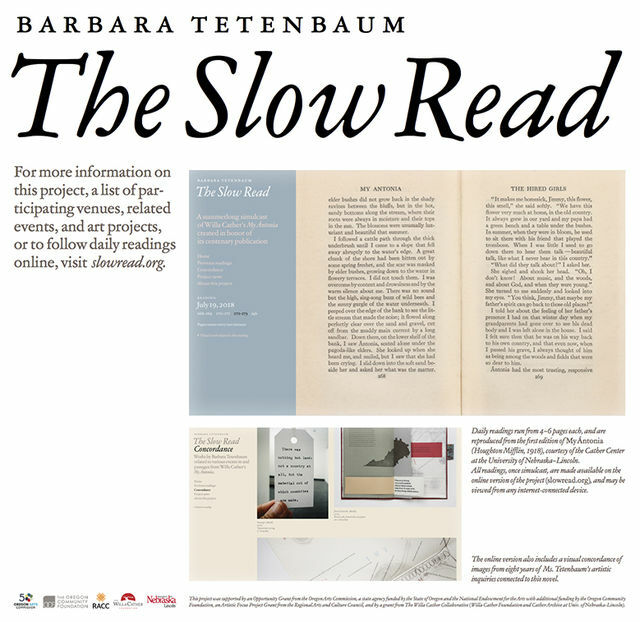 The PNCA Library is proud to be a site host for The Slow Read, a public literary and fine art project produced by Barbara Tetenbaum in honor of the centenary publication of Willa Cather’s novel My Ántonia. Readers around the country and the globe can experience a slow unfolding of this important American novel— three page spreads per day—at the PNCA Library. The project begins on May 30 and ends on August 11, 2018. Join us to read your daily pages or follow along on the website: https://www.slowread.org/. The project may be viewable through the library window into the atrium, Monday – Friday, 9 am – 5:30 pm. Please see further summer library hours to the right.